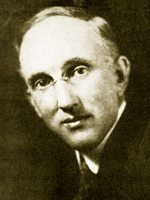 Homer Davenport was known around the world as a former citizen of Silverton. His friends are erecting a monument to his memory in Silverton, where he was buried. He was a cousin of Mr. Frank S. Bowers (right—from the Silverton Appeal-Tribune, August 5, 1982), who has written the accompanying article. As Mr. Bowers is a cartoonist of national fame, he is able to speak with assurance on his subject.—Murray Wade; Editor & Publisher, Oregon Magazine, 1924. So much has been published regarding the boyhood and life of my cousin, the late Homer Davenport, that anything one might say along that line would simply be needless repetition. Therefore I shall simply endeavor to give the reader of the Oregon Magazine, as faithfully as I can, a short account of Hom­er and his works as it has impressed one who has always been more or less vitally interest­ed in the line of endeavor that made him famous. Cartoons. Al­low me to say that I consider him Oregon’s one outstanding nation­al character. A born democrat and humorist—understand when I say democratic I make no reference to the party-type of political democrat. He was democratic in every tendency and in his work. It was this quality in him, I feel, that gave him the love and admiration of a host of friends ranging in the social scale from pauper to millionaire. At Homer’s birth, his father, who was an ardent student and believer in phrenology, looking at him said: “If he lives to manhood he will he a humorist,” and to be a humorist must one not also be democratic? This quality of humor and his gift of character was plainly exhibited in his earliest attempts at drawing. While just a toddler he covered all the available white paper that came within his reach such as fly leaves from a lot of old patent office re­ports that had been sent to our grandfather, R.C. Geer, with drawings mostly of animals. These drawings showed a skill that did credit to one much older than he. He had the faculty at that early age, to draw a monkey so you knew at once that it was a monkey, and other animals were depicted with equal faithfulness. Each animal was however, caricatured just as were his men of later years. We have all heard the expression—“More Natural Than Life.” If that was ever true it could be said of his character studies. They were unmistakable exaggerated likenesses—a gift of his at which he excelled any man before or since his time. Added to this likeness they depicted the subjects character. Something that never shows in a photo­graph nor in life to the eye of the casual observer. On a visit to the National Capital, I sat in the press gallery and recognized about half of the U.S. Senate from Homer’s sketches. His work was full, not only of human interest but also of humane interest. His pencil was possessed of a brutal frankness that caused him to be feared by some who came under its point. 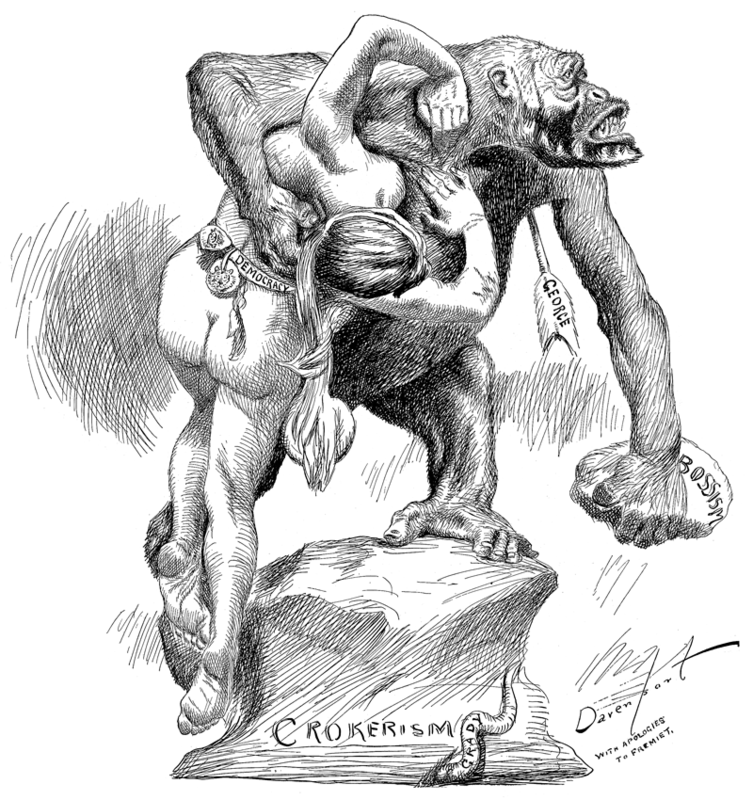 Take for instance his gorilla cartoon (left—from “Cartoons” 1898—click for detail) of Richard Croker, who was depicted as a gorilla clasping the form of a woman labeled democracy, in one great hairy arm while lifted in the other hand was a stone to crush out her life. 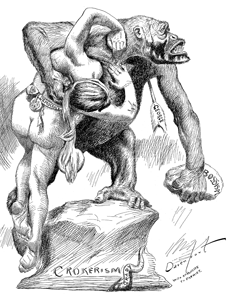 The face of the beast was all gorilla and at the same time unmistakably Croker. The next day Croker, whose impenetrable crust had turned the shafts of New York editors as a two inch plank would turn straws, was heard to tell that particular henchman that he must drop him as the papers were making it too hot for him. Homer was the closest observer of small details of any of the world’s cartoonists. If a man’s coat tails were inclined to turn up, turn up they did in his drawings. He was without art school training. In his early San Francisco days he tried studying art at the old Mark Hopkins Art school. After making numerous sketches of some casts of horses heads and a few unflattering likenesses of instructors, he made the fatal mistake by telling one of them of his ambition to cartoon—getting this reply: “Get a wide brush and a straight edge and you are as good as any of them.” That was when he graduated from Art School. He also in those days, had an ambition to rival Frederic Remington on horses. I think perhaps one of the strongest features of his work was that he never shot over the head of the public in general. Even those who were not of the reading kind read his pictorial editorials, and either loved or hated him for them. In not shooting over the heads of the public he has been credited with pretty much demolishing the political heads of a number of men whom he has opposed. In one of our eastern cities stands a monument to George Dixon for so long light weight champion boxer of the world built by his admirers. In marked contrast to this is the final resting place of Homer at Silverton, Oregon. Will Oregon be content to let this be so? To let her one real big National character to go without some memorial of esteem? It need be nothing pretentious. A dignified massive rugged stone, typical of the West, with a huge tablet telling future generations who Homer Davenport was and what he did.